"Regattas can be hot, cold, sunny, rainy, fun, boring, and exciting, all on the same day." Before you go to the regatta, print out a schedule of the day's races, which is usually posted on the Race Day Schedule on the night before the regatta. Early morning weather at Sandy Run can be windy and cold. Then the weather may change to warm sunshine or a cold drizzle. Prepare yourself for comfort by dressing in layers. Wear Robinson Crew Spiritwear to show your support for the team. Wear comfortable shoes to help you navigate the long rocky trails at the park. 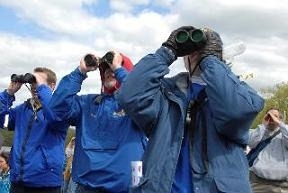 Bring a chair or pad to sit on, and bring binoculars to see the races. Most Robinson Crew regattas are held at Sandy Run Regional Park, where our boathouse is located and where our rowers train on the water. A typical regatta includes about a dozen schools, each racing several boats. Rowers are required to arrive early to prepare for the race. Races typically start in the morning and run through the afternoon. Often, upper boats race in the morning and lower boats race later. Check the schedule to find out the planned start time for each race. Remember that race times may change based on the weather or other factors. The coaches will tell the rowers what time they need to arrive. Plan to arrive early, since it may take 30-60 minutes to reach the grandstands from the time you arrive at the park. If you drive to Sandy Run, be prepared to pay a parking fee before you enter the park on Van Thompson Road. VASRA's parking fee is $15 to $20 per car this year. Carpooling is recommended. If you signed up to serve as a volunteer on regatta day, be sure to sign in at the boat ramp before going to the grandstand. This signup station is staffed by VASRA. Before you travel to the grandstand, you may want to stop near the boathouse to enjoy the spectacle as hundreds of rowers carry their boats to the water. If you hear someone shout "heads up", that means a boat is coming through, so move out of the way. The boats are heavy, hard to maneuver, and expensive to repair. There is a trail to the grandstand that can be found near the boathouse near the docks. Another trail to the Grandstand begins just inside the main gate (in Lot C). The one-mile trip to the grandstand covers steep hills and unpaved trails, and takes 15-20 minutes to walk. On race days, you can avoid the walk by paying a nominal fee for the shuttle to the Grandstand that runs from the parking lot inside the main gate. Near the Grandstand you will find programs and race schedules, T-shirt vendors, and a concession stand selling hot and cold drinks and food. When you reach the grandstand, look for other Robinson Crew spectators wearing Robinson blue and gold. The Grandstand offers an excellent view of the finish, but binoculars will help you see more of the race. You may wait two hours to see a five-minute race, two minutes of which you can see without binoculars. But it's an exciting 2 minutes, and well worth the wait. You can cheer for all the Robinson Crew boats and learn a little something of what Crew is really all about. Sandy Run is managed by the Northern Virginia Regional Park Authority and defines the Rules and Regulations for the use of the park facilities. The link below is the official park Rules and Regulations that should be read and understood by rowers and their families.